Zack's Nana's Creative Imagination: Stampin' Up! 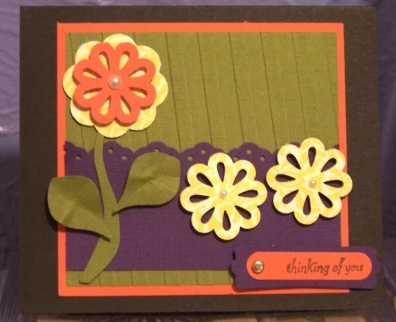 This card was created using the sketch from the September issue of Stampin' Success. It's very simple to make and incorporates several Stampin' Up! products: Stripes Embossing Folder pg. 218, Eyelet Border Punch pg. 211, Blossom Bouquet Triple Layer Punch pg. 211, Word Window Punch pg. 209, Modern Label Punch pg. 209, and the leaves are from the Blossom Petel Builder Punch. If you'd like to duplicate this card you can purchase the products used from HERE.